The Cockermouth, Keswick, and Penrith Railway was built as a mineral line between 1862 and 1864, to link Workington in the west, to Durham in the east, connecting at Penrith to the direct railway route through the Pennines over Stainmore from the Darlington area, and to the West Coast Main Line from London to Glasgow. The little Cockermouth, Keswick and Penrith Railway was initiated to establish a vital link in the railway chain which connected the two great iron producing areas of West Cumberland and Durham. To many, it was a humble and almost unknown railway, not possessing any locomotives of its own, or any rolling stock either – apart from a few ballast wagons. Two great pre-grouping railways, the London and North Western and the North Eastern, worked the line, and from 1889 onwards two directors from each Company sat on the C.K. & P. Board. At Penrith the C.K. & P.R. trains started from a covered platform on the Downside of the station. At Keswick Junction, 638 yards south of Penrith station, the C.K. & P.R. line branches off from the Main line and runs parallel to it for a short distance before making a “climbing turn” to the right and westwards. The gradient soon steepens to 1 in 70 and this is the ruling one to beyond Blencow. At Redhills, 1 mile and 418 yards from Keswick Junction the spur of the North Eastern Railway, from Eamont Bridge Junction on the L. & N.W.R., came in from the Up side of the C.K. & P.R. This spur line was the means by which coke trains from Durham to West Cumberland and loads of haematite iron for smelting and pig iron for shipment from West Cumberland to the East Coast works and ports were worked to and from the North Eastern territory via the C.K. & P.R. The N.E.R. worked their traffic from Darlington via Barnard Castle, 5tainmore Summit and Kirkby Stephen to Eden Valley Junction on the main L.N.W. line, from whence they had running powers into Penrith. This spur, from Eamont Bridge Junction to the C.K. & P.R. at Redhills, obviated reversal at Penrith. It left the North-Western line on the Down side and passed under the C.K. & P.R. track before Joining it on the Upside at Redhills Junction signal box. 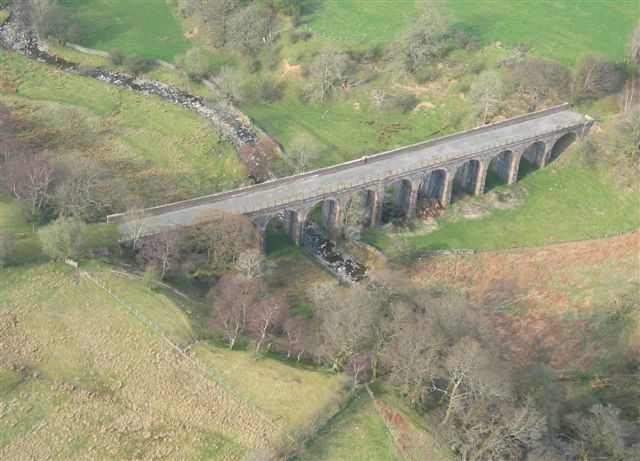 It was constructed in 1866 and the line from Redhills was doubled as far as Blencow (2 miles and 110 yards from Penrith) in 1900. 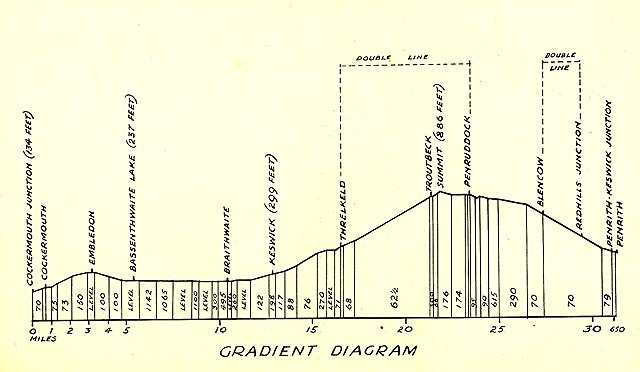 From Blencow it is four miles to Penruddock and in order to ease the gradient the line was constructed in a wide sweep to the south before swinging W.S.W. again. Between Blencow and Penruddock sidings served Flusco Quarry (belonging to the Company) and Harrison’s Limeworks. No signals, were provided to protect the sidings into either place, but the points can only be unlocked with the train tablet. 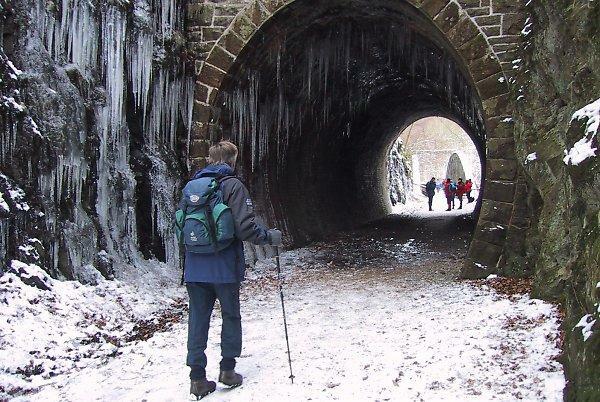 The country hereabouts is still mainly of a farming character and beyond Flusco limeworks the track runs through Andrew’s Cutting, cut out of solid rock, and a portion of the line subject to snow drifts in severe weather. 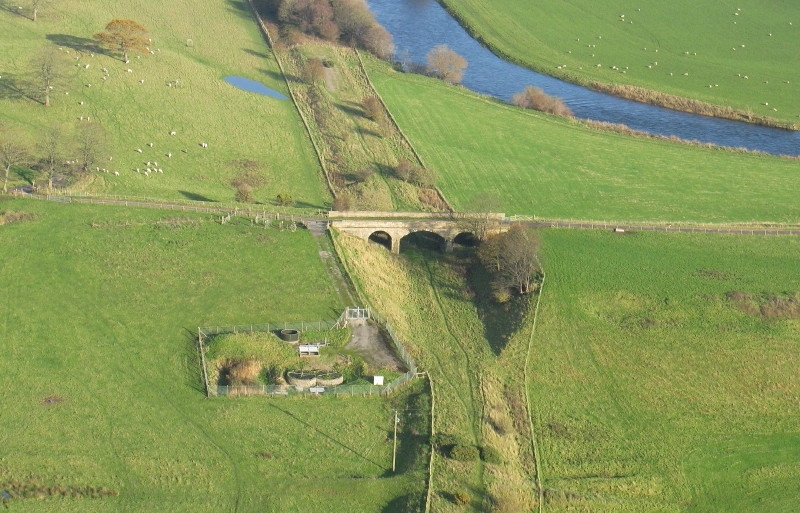 Beyond the cutting, the track falls sharply down to Peuruddock station which is approached over a short stone viaduct. From here the line, doubled in 1900, climbs again over open moorland to the summit at Troutbeck Down distant. The height here is 886 feet above sea-level and only 26 feet lower than Shap Summit. On the right, the heights of Saddleback and Skiddaw can be seen looming up, while to the left the hills bordering the north bank of Ullswater and, further away to the South-West the Helvellyn range, can be seen. From Troutbeck Summit there is a short stretch of 1 in 66 down, followed by an easing to 1 in 300 into the station. While the goods yards at Blencow and Penruddock were the usual small country affairs, Troutbeck boasted quite an array of sidings, and a substantial water tank. Troutbeck is only a small hamlet laying at the point where the road down to Ullswater Lake at Gowbarrow Park branches off from the Main Penrith-Keswick highway. The reason for the extensive sidings was two-fold. First, to provide storage accommodation for heavy trains which had to be worked up the long climb from Threlkeld to Troutbeck in more than one portion, and secondly to accommodate cattle trucks for the periodical sheep sales held at the Troutbeck Auction Mart, close to the station. Since the majority of the locomotives had used a considerable amount of their water supply after coming up the gradient from Threlkeld, the provision of a good sized water tank at Troutbeck was a vital necessity. Immediately beyond the station the line steepens abruptly to 1 in 62 down and this is maintained for 4 miles to within a short distance of Threlkeld station. Here the station was constructed on the island principle. 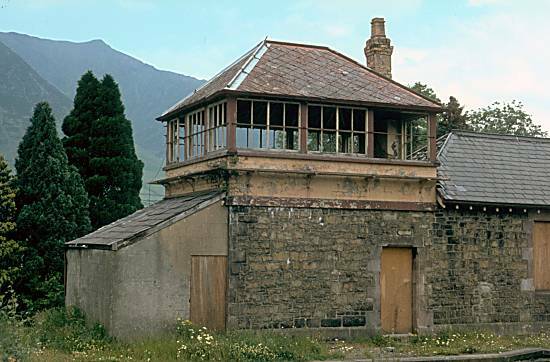 The unusual signal box at Threlkeld Station. Photograph by John Hinson, c1974. There is only a very small goods yard, but extensive sidings serving the granite quarries on the. Down side were put in; these became semi-derelict when the quarries ceased operation a few years after the 1914-18 war. 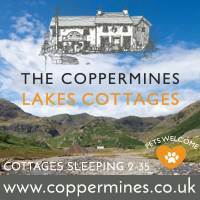 There were also some lead mines in the vicinity of Threlkeld, but these ceased operations about 1924. During the 44 miles from Troutbeck to Threlkeld the C.K. & P.R. falls nearly 400 feet, and follows the south side of the valley running down towards Keswick. Just west of Troutbeck the track crosses Mosedale by a stone viaduct which has 30 arches, each with a Span of 12 feet and a total length of 404 feet. Mosedale Viaduct. Photo by Simon Ledingham. The long section between the two stations was broken about half-way by Highgate signal-box. Here also there was a short platform serving some of the scattered farms and cottages on the South side of the valley. 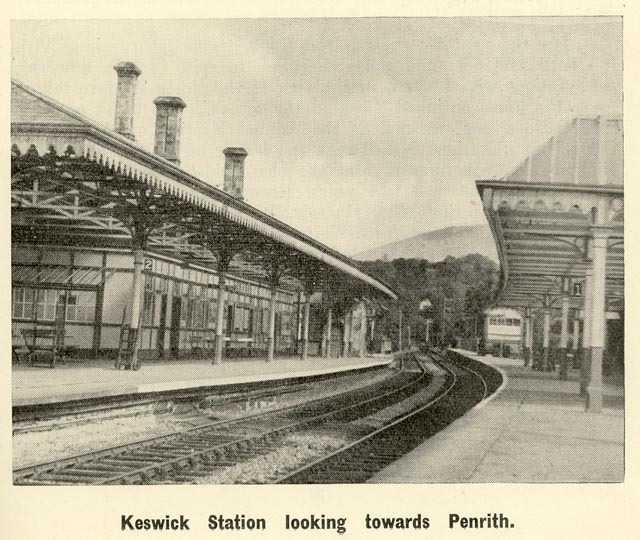 The early morning train to Keswick called here to collect children attending Keswick school and the afternoon train in the opposite direction deposited them back there. On leaving Threlkeld the line, once more single, swings across to the north side of the valley just before it narrows acutely. To the left is the entrance to St. John’s Vale and ahead the ground rises sharply before the final drop into Keswick. The only way open to the C.K. & P.R. 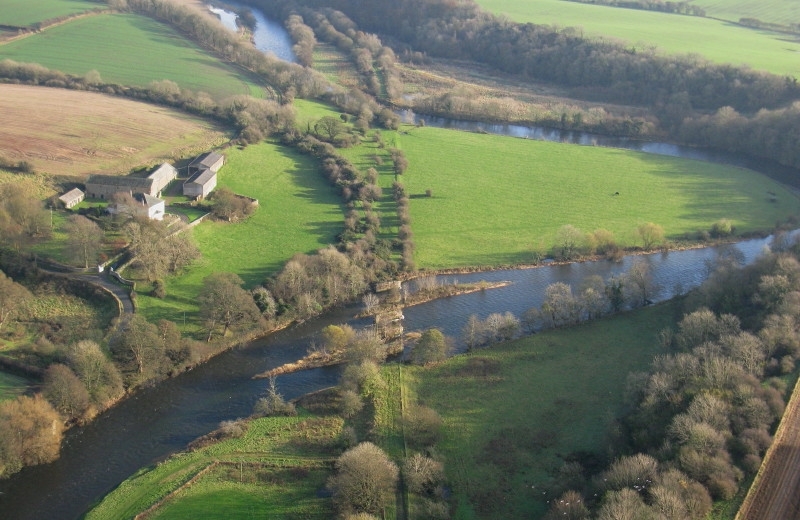 was to follow closely the course of the River Greta. It therefore runs down quite a deep gorge during which it crosses and re-crosses the river several times by means of a series of bowstring girder bridges. There is also a very short tunnel through a shoulder of the cliffs overhanging the river. About a mile short of Keswick there is a short siding, on the Up side, serving the Briery Bobbin Mill. Looking back though the “Little Tunnel” (bridge 72). Photo by Ann Bowker. The gradients between Threlkeld and Keswick vary between 1 in 117 and I in 76 maximum, (all falling towards Keswick). The 1 in 76 portion is a mile long, ending just before the line emerges from the gorge and passing under the main road eastwards out of Keswick, runs along an embankment into the latter station. Keswick station was provided with three through platforms, connected by a subway, and also a short “dock” one at the west end of the Down and the East end of the Up platform. The extra platform is on the Up side and there is another goods running line, behind that. A turntable was put in on the Up side of the third platform, while a goods yard was provided on the Down side, beyond the station. 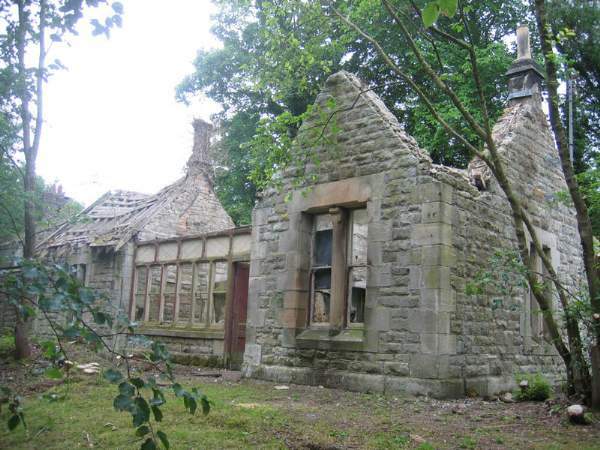 The station buildings, in common with the rest on the line, were substantially built of local stone. 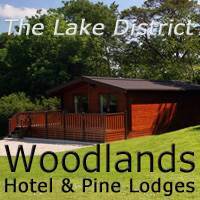 Here were situated the offices of the Company, and a covered entrance led directly into the Keswick Hotel. The Keswick Hotel was built by the C.K. 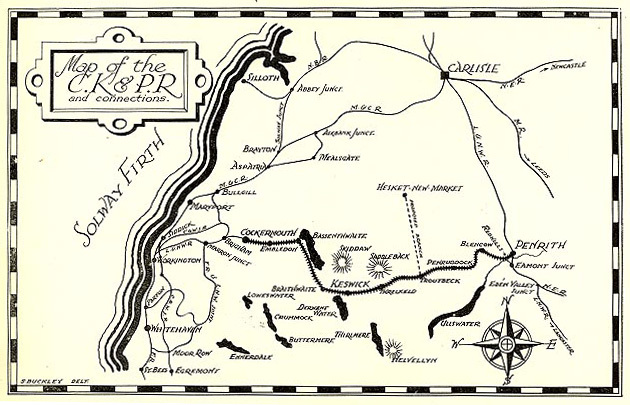 & P.R., but was disposed of later to private ownership. 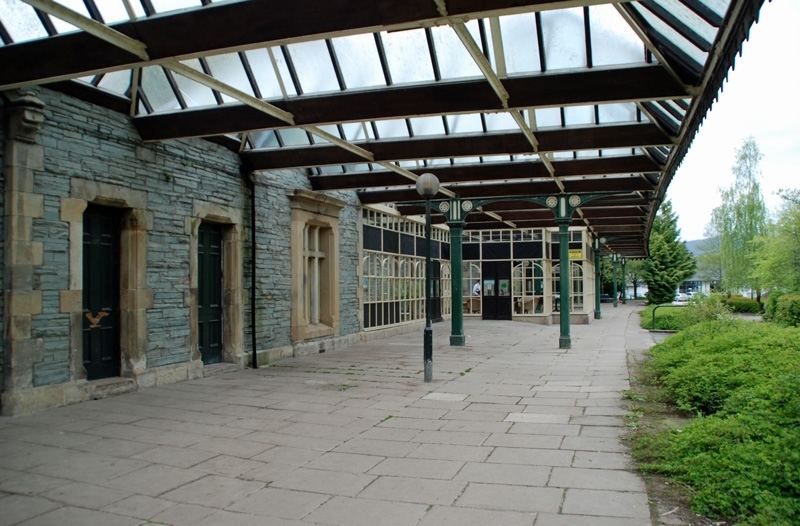 Keswick station was the first one on the line to be lit by electricity (early in the 20th century), the remainder, with the exception of Cockermouth being illuminated by acetalyne gas. Cockermouth drew its gas lighting from the town gasworks. Two signal boxes were put in at Keswick: the east end of the station being controlled by “Keswick B” and the goods yard by “Keswick A”. These became Nos. 1 and 2 in L. M. & S. days. For the first mile westwards from Keswick the line falls on a gradient of 1 in 122 and then runs on the level, or nearly so, across to the south shore of Bassenthwaite Lake. The first station beyond Keswick is Braithwaite (20 miles from Penrith) where there is a small goods vard on the Down side and a refuge siding. Although Braithwaite is a block post, only a goods train and a passenger train can be crossed there. 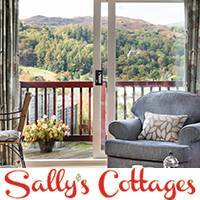 The line now runs along the edge of Bassenthwaite and excellent views of the Lake and Skiddaw towering above can be obtained from the train. Bassenthwaite Lake station (25 miles from Penrith) is pleasantly situated among trees just West of the end of the Lake. There is a passing loop here and a couple of sidings which handle a fair amount of timber traffic from time to time. Bassenthwaite Lake Station – June 2007. At the west end of Bassenthwaite Lake station the C. K. & P.R. crosses the main Keswick – Cockermouth road on the level, the gates being mechanically operated from the signal-cabin. There are only two other level crossings on the line, both being between Bassenthwaite and Embleton, but neither are mechanically worked. Embleton, the next station, and 2 miles on, is approached on a rising gradient of 1 in 100. A few hundred yards short of the station a siding was put in on the Up side to serve the Close Granite Quarry of the Cumberland Granite Company (later the Keswick Granite Company Limited). The points are controlled by a small ground frame unlocked by the train tablet. 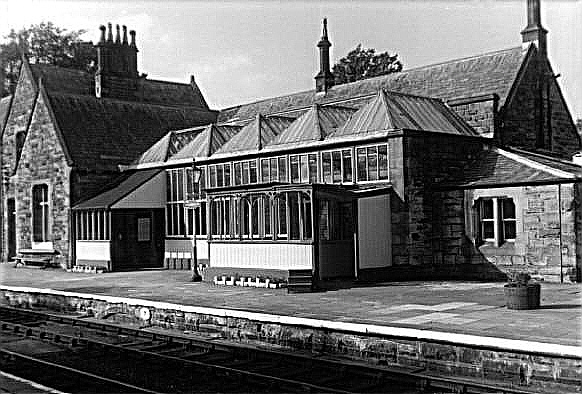 Embleton (28 miles from Penrith) is a block post, but only has one platform. There is a small goods yard on the Up side, facing Cockermouth and this is often used to store empty wagons for Close Quarry when these are brought in by Down goods trains. A quarter-of-a-mile beyond Embleton, the C.K. & P.R. reaches its maximum height above sea-level between Keswick and Cockermouth 315 feet above sea-level. The fall towards Cockermouth from this point starts at 1 in 150, steepening to 1 in 75 for three-quarters of a mile, followed by another half-mile of 1 in 75. The track swings round to the south side of Cockermouth town where the station has three platforms, carriage sidings and others serving the local petroleum depot. Originally a turn-table was also provided there. 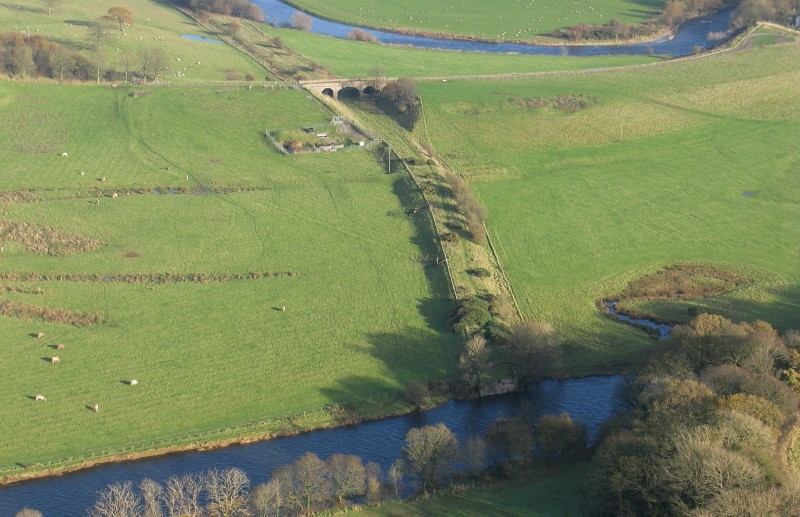 For the last half-mile down to Cockermouth Junction the track falls at 1 in 70, crossing the Cockermouth – Workington main road by a high stone bridge and embankment to make an end-on junction with the Cockermouth and Workington section of the London and North Western Railway. Cockermouth goods station is on the Up side and occupies the site of the original terminus of the Workington and Cockermouth Railway: from here on to Workington the line is double-tracked. A refuge siding was provided on the Down side in which the North Eastern locomotives “parked” their loaded coke trains for onward working to Workington by the North Western locomotives. 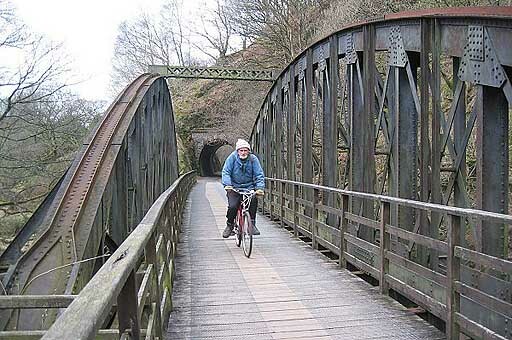 The length of the Cockermouth, Keswick and Penrith Railway was 30 miles and 65 chains. The line had a total of 135 under and over-bridges. 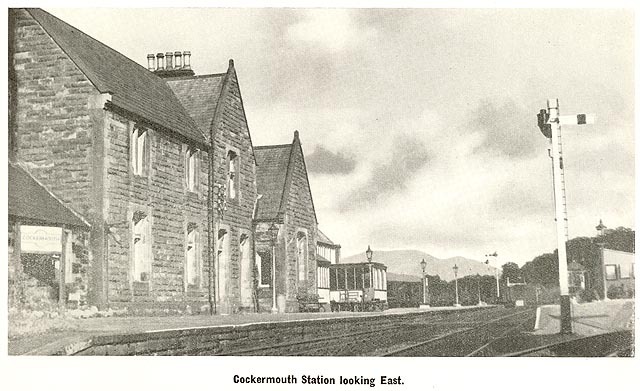 The text above was taken from a small booklet “A History of the Cockermouth Keswick and Penrith Railway”, published in 1948 by the author, W. McGOWAN GRADON. The Beeching Report of 1963 recommended closure of the line. 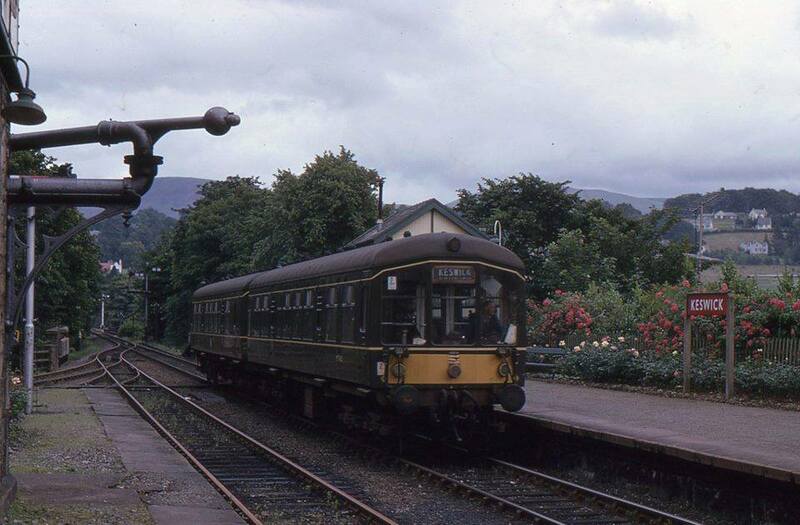 On April 18th, 1966, all passenger services west of Keswick Station were withdrawn, leaving an 18-mile long branch from Penrith to Keswick. Final withdrawal of all passenger services took place on Monday, March 6th, 1972, and on a wintry Saturday, March 4th, 1972, the last passenger train traversed the CK&P. The section from Penrith to the Flusco Lime works siding remained in use until 19th June 1972. The trackbed from Cockermouth to Keswick, via Bassenthwaite Lake, has been used for the A66 trunk road, which opened in September 1977. There is a proposal to reopen the line as a modern railway and a feasibility study has been commissioned by CKP Railways to examine the business case. However, Eden District Council appears to be against the reopening plan and are allowing development at Flusco Business Park to straddle the trackbed. Photos of the C.K. & P.R. 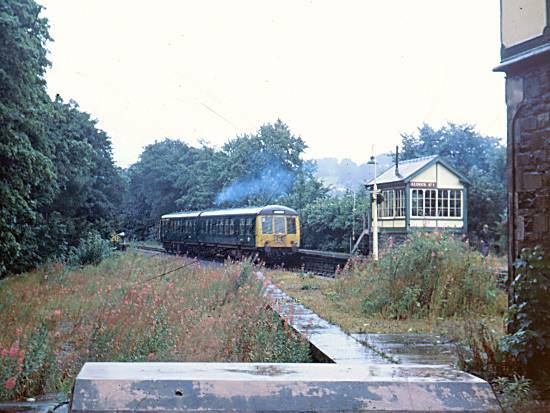 from the Derwent Railway Society.